Being a fan of anthro animals doesn't make someone furry. I personally love Housepets and the idea of anthropomorphized animals like them, but I don't identify myself as a furry. What makes someone a furry by our standards here on the HP forums is that they say they are one. If you want to be one, you are. If you don't, you aren't. The great debate about how much anthro art you look at or something similar is not worth getting into because everyone has a different idea about what the threshold for being considered a furry is. Yeah, I'm not sure if I am furry either. Is your avatar a picture of your suit? Check out this post many others of Tycho around in the same thread. I guess I was being just a teensy bit sarcastic, but was meant in a friendly, lighthearted way. "I'm not a furry, I am an anthropomorphic genre enthusiast"
which kinda-sorta means the same thing. At least I thought it did once. I think there's so many different definitions now, it's all mixed together. It's like the word "love" in the english language can mean so many different things. Latin has four different words for love(Philios, agape, eros, Storge), and there are different intensities of each. Furry has similar issues; from fursuiters to cartoon watchers, to lifestylers, to even therians. So, if I say I 'love' ice cream, it doesn't necessarily mean I have an exclusive diet of it. Neither so with furry. Hey, haven't we been over this before? That's actually Greek, Tycho, but you make a good point. To answer the question "are you furry", you first have to work out what "furry" means to you. I say, yes I am because I enjoy anthropomorphic act and media and because I wouldn't mind having a fursuit and going to furcons but being part of "the community" isn't necessarily what makes you a furry, unless you want it to be. There are all kinds of definitions out there of what is furry and what isn't so it's best to decide for yourself what being furry means to you and if that's a way you want to identify yourself. But yes, this has been discussed before. I suppose it doesn't hurt to reiterate it though for the newcomers or people that haven't been to this thread before. I suppose it doesn't hurt to reiterate it though for the newcomers or people that haven't been to this thread before. I'm a newcomer and haven't been on this thread before. Last edited by ArcWolf on Wed Apr 23, 2014 6:08 pm, edited 1 time in total. So, um. Did you have anything to... you know... contribute? Well perhaps that was demonstrating that the stuff is worthwhile to reiterate. Yeah! Lets go wit that! Anyway, I saw some kid at my school saying he was a furry today, quite happy to see that nobody even blinked an eye at it and its not seen as abnormal. That's good! Glad to hear that people are more tolerant and understanding nowadays! Yeah, I think folks nowadays are just generally becoming more tolerant of the unusual. Either that or they just can't be bothered to really care...one of the two...perhaps a bit of both. I agree with Tychoaussie and Hlaoroo, their discourse is very good. There's always the fact is that the mass identifies as furries only the people who wears animal-like costumes and use them for groups and conventions meeting and even everyday. We know that's not correct. It's not the only costume who makes the furry. I now see the definition of "anthropomorphic genre enthusiast" more appropriate only for those who love and are interested in the genre of media and of art featuring anthropomorfic animals, knowing or not about the furry people and how they make and use anthropomorfic animals characters. If I want to see this considering a levels range of being a furry, this is the lowest one. To answer the question "are you furry", you first have to work out what "furry" means to you. I say, yes I am because I enjoy anthropomorphic act and media and because I wouldn't mind having a fursuit and going to furcons but being part of "the community" isn't necessarily what makes you a furry, unless you want it to be. Ok, now stop with this brainstorming. Most furry hate stems from the internet, and internet culture moves fast. Making fun of furries isn't as "cool" as it used to be. Probably because stuff like this is on the YouTubes. I mean, how can you hate that? Even I don't hate that. That and the fact that the adult side of furry is more often then not out in the open. Anything fetish-like is going to get made of really. True, but it's like non furry stuff, people that wanna make fun of us SEARCH for that stuff so they have more hate-ammo. It's less cool than it used to be, but there will always be people who take it upon themselves to be ignorant of others, despising them greatly, even to the point of rationalizing a burning hatred in their hearts simply because they cannot entertain the thought that all individuals who make up such a repugnant group are, at the core, very much like themselves. 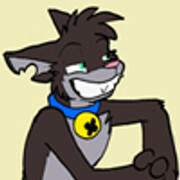 I am a furry myself (Cat), have been for a few years now actually. Although, the first year I was quite shy about it, I began being more open recently, meeting more friends that are furs as well really helped. I literally died from all of the cute in that video. I'm really sorry to hear that - R.I.P. Who is now writing here with your account? I am. I'm just a ghost now. Is it okay if I haunt you guys? My only reaction to the video was "Daaaaaaaaw", my parents are and shall remain confused. Nah, the position as poltergeist is taken, but there is still an open vacancy as tooth fairy (here). He is revived. Shukaku is the one typing, I'm just telling him what to type. Hey y'all! Sunday is the start of Species Change Week (May 4th - May 10th). This year I'm going to be a kangaroo. Tell all yer furry friends about SCW! You are and always be a Sleet. Once a fox always a fox for me. I've never heard of SCW before. Is the change permanent? Pretty sure I'll stay a quoll anyway but just for interest's sake. the change is not permanent. In fact SCW a few years back is when my shape-shifting powers started. I primarily use my human form, but when hanging around furries I switch between a bunch of animals as I feel like it. though recently I've started defaulting to my dog form in chats with furries. Cool. Keeping your options open. I like it. I'm going to be a fennec fox, but still the same ol' jinchuriki of Shukaku. My folf is still in the works...These take time, like a child, you watch it grow and change.